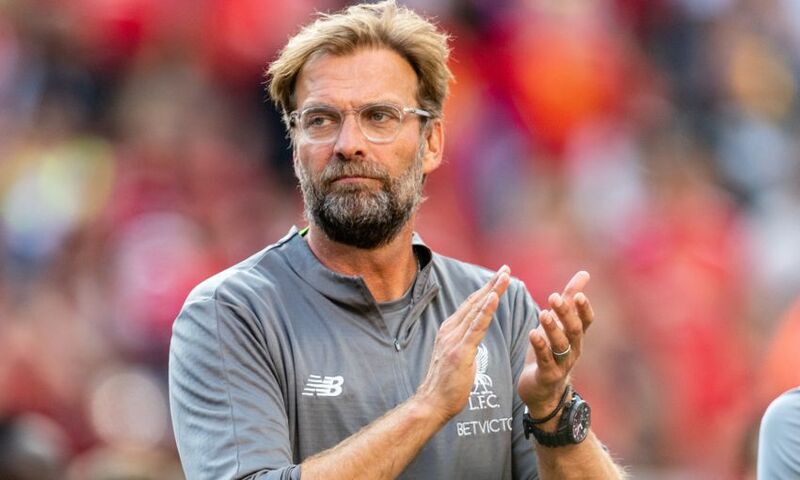 Jürgen Klopp reflected on a fantastic evening's work after Liverpool beat Manchester United 4-1 in the International Champions Cup at Michigan Stadium. More than 100,000 fans saw Sadio Mane, Daniel Sturridge, Sheyi Ojo and Xherdan Shaqiri – with a sensational overhead kick – strike to defeat the Reds’ fierce rivals. It was good, obviously. That’s not normal after four days at the club. He adapted that well to the style of play. We wanted to help him a little bit with a position that was not too complicated and gave him a lot of freedom offensively, playing naturally plus offering runs in behind, which we did, especially around the first goal in the second half. Daniel Sturridge’s goal was a nice little offer; he saved the ball and passed to Daniel to finish. It was better than I would have expected, to be honest, but I think today was a game where it was quite easy to come in for pretty much all of them because we played really good football over 90 minutes on a very, very difficult pitch for both teams. The ball doesn’t bounce properly, it was very dry. That makes football difficult. But we still played simply and quickly and kept them moving. That was good. After the Dortmund game I didn’t feel good but I knew I didn’t have to make it bigger than it is – it’s a pre-season game so if you make mistakes you should lose, that’s OK. If you learn from it, that’s good as well. Today we don’t make it bigger, of course – it was a pre-season game, but it was a good game and from that point of view I am happy with it. He decides that, pretty much. That’s how it always is with players. You can see that he is enjoying himself in the moment. The most important thing, we always said, is that Daniel stays fit. The reason he only played half an hour today was just that it was an intense week for us and I didn’t want to go with any risk with him. Usually we could say 60 minutes for him today would have been OK, but he was so good in the last few weeks for us – so no risk. He was obviously fresh when he came in and enjoyed the game. 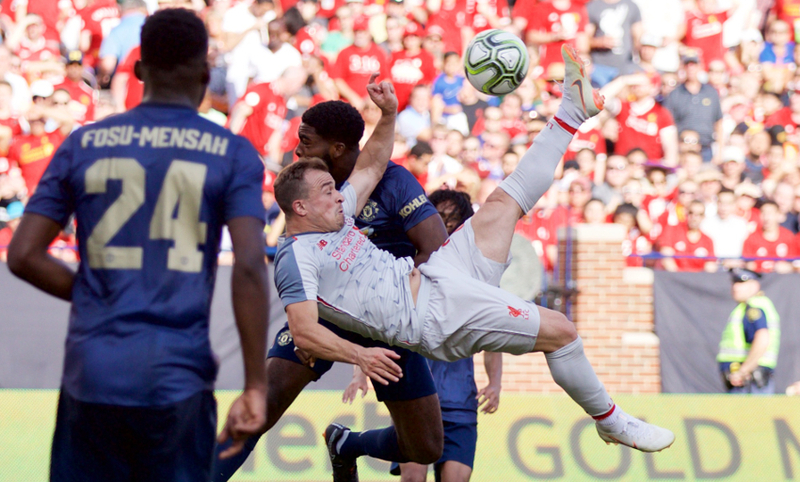 Together with Shaqiri, he enjoyed a lot; Ojo and Ben on the offensive wings were involved in all situations, that was really flexible and good. We will see. Hopefully [he will be] very important, to be honest. The atmosphere was outstanding when we arrived here. It was really nice, the reception was really nice. This time there were a few Manchester United fans involved when we came here, so they were not all on our side but it was completely fine. The stadium is fantastic. Another difficulty of the pitch was that it is an American football pitch, so it was not that wide. It was very narrow so it makes football as well not really easy. But having 100,000 people here is of course fantastic. This summer? No, I am happy with our players, to be honest, so I don’t see the need. When you see Joe Gomez playing in that role tonight as a central defender, he combines a lot of things you don’t find in the transfer market, to be honest. I can’t see in the moment the need, but there are 12 days to go and a lot of things can happen. You ask me now and I say no, but maybe if you ask me tomorrow I will say something different. I don’t have to, that’s clear. We have a fantastic relationship, that’s how it is. I like him a lot as a person and as a player especially. He is an outstanding player. When I came here, I was very excited about the fact I will work together with him back in 2015. Since then he has had a few injury issues and we couldn’t change that, he couldn’t change that, it happened. A lot of others improved. When I came in one problem of the club was that Daniel would train two days and then everyone would ask if he can play the next game after six weeks with an injury. I said, ‘no chance, he needs to train’ because that’s how I understand the game. I am completely open to individualising training and saying ‘you do that, you have to do that more’. There is no doubt about his quality, if Daniel Sturridge is fit, he will play a role in the team, 100 per cent. Does he have to play 50-something games? No. But hopefully a few really good ones. That’s the plan. I would say it makes sense if we talk about these things with the players and not in the press conference. Yes, all the young boys who came on today are in really good shape this pre-season, to be honest. They had little holes because of the intensity. Sheyi is a really confident boy as he showed tonight, not only around the penalty when he sent Daniel Sturridge away! You have to be really confident to do that! Pedro Chirivella in the No.6, a fantastic football player. Marko Grujic together with him organising the whole pitch pretty much. Curtis Jones played his first game as a full-back in front of 100,000 people – I would have been nervous, he wasn’t. Rafa Camacho plays a pre-season that is just fantastic, mostly as a full-back which he’d never played before, so they’ve learned a lot. Ben Woodburn is 100 per cent back, for example. How it is with young boys, from time to time the improvement doesn’t go day by day, but he has played such a good pre-season. Nat Phillips, my god – what a pre-season he has played! These boys are completely open. What we will do with that and when, we will see. Very important, we don’t have more time because the season starts shortly, so it’s very important they can get minutes. For Shaq, in the moment he signed he wanted to stay immediately with Liverpool and train with us, one week after he finished the World Cup. We had to tell him no, go [on holiday]. When he came back this week, he was really excited and for him it’s a very good moment in his career. He was at Bayern, was at Stoke, was at Inter, important moments in his career. Now we have him and he can play with a few really nice football players. Fabinho struggled physically because he wants to do everything at 100 per cent. He was really tired, but yesterday, we saw it in training he had fresher legs. What a fantastic player he will be for us. It’s not only the new players; football is all about tuning to bring all these different skills together. Tonight it worked out well but we will not overestimate. It’s only a pre-season friendly and we will play again and then we need to be ready again.